When we spoke to Jan Rezab, the founder of social media analytics company Socialbakers, one of the main topics he discussed was how the site is able to deliver data on engagement rates on social networking sites. Socialbakers has just shared some interesting data that gives insight into which brands are successfully engaging users on Facebook, and which are finding more luck on Twitter. Over all, it’s not surprising to find that Facebook is a far more suitable tool to use when trying to engage fans. 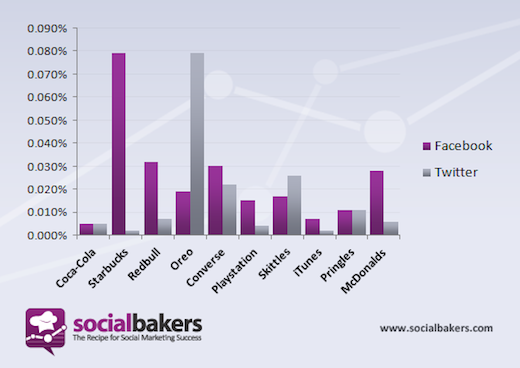 Socialbakers takes a look at some of the top brands on Facebook – Coca Cola, Starbucks, Red Bull, Oreo, Converse, PlayStation, Skittles, iTunes, Pringles and McDonald’s – and compares its presence on the social network to its presence on Twitter, over the past month. Twitter on the other hand is limited by 140 characters but at the same time its content reaches more people (Facebook has some content dedicated only to Fans who click on the Like button)and can be posted more often. It´s great for brands that have the need for live streaming, blogging and promoting ideas. Studying the top 10 brands, six of them are able to better engage their fans on Facebook, two are more successful on Twitter, and the remaining two enjoy similar results on both social networks. Starbucks, Redbull, Converse, Playstation, iTunes and McDonald’s enjoy a higher average engagement rate on Facebook rather than Twitter. On the other hand, Oreo and Skittles enjoy a higher average engagement rate on Twitter. As explained in the post, the reason behind this comes down to specific social media campaigns. Oreo cookies are celebrating their 100th Bithday and they are asking their fans to share their Oreo moments and Oreo rituals on Twitter. They are asking for the same engagement on Facebook but perhaps Twitter is more spontaneous and fun for this kind of communication. For the remaining two brands, Coca Cola and Pringles, the engagement rates on Facebook and Twitter are identical. However, both brands have relatively low engagement rates to begin with, so it may have more to do with their overall approach, rather than the platforms themselves. While Facebook does give brands more tools to engage users, it’s worth bearing in mind that Twitter is still in the process of fine tuning its platform. Facebook makes it easy to connect with fans, but Twitter encourages creativity and a little bit of thinking outside of the box. Looking for a few tips and tricks to use on Facebook? Be sure to check out this list of 5 ways to increase your engagement on Facebook.